On Sunday morning 27 Chelsea & Fulham riders definitely had big smiles on their faces. Gathered around outside Warr’s at 9.15am we went through the ride briefing - a 110 mile run down through Hampshire’s finest country roads and twisty lanes in the New Forest to Sammy Miller’s Harley Day at his museum in New Milton. The sun was already beating down and everyone was eager to go. With a cacophony of Screamin’ Eagles and a sluggish bound up Putney High Street and onto the A3 - we were free! 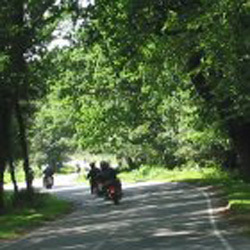 We headed south-west, early enough on a Sunday for a pleasant ride itself. Turning further south onto the A31 Hog’s Back just increases the grin factor. Pocket-rockets and Tupperware-torpedoes buzzed and sizzled by - they can’t SEE anything at that speed. Our thundering snake of chrome and leather was no slouch, and we can savour the countryside. Just beyond Alton we dived into real ‘green and pleasant land’. 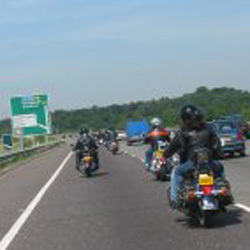 What more could us bikers want - bright warm sunshine, vivid blue skies, fluffy cumulus, leafy tapestries, English garden aromas - and the rumble of Harleys. The highlight of our ride-out was to come. Taking a planned ‘two sides of a triangle’ route, we slowly weaved our way through the most picture-postcard New Forest scenes imaginable. Giant redwoods towered above while streams and brooks tinkled and meandered below. Breaking out into more open forest area, ponies were everywhere, strewn like different coloured pebbles over a rough green baize. 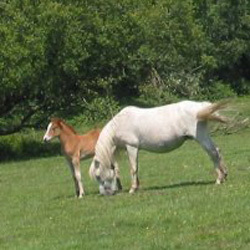 Foals suckled and lazed in the midday warmth. All too quickly it seemed, the B3055 beckoned, and we were close to New Milton and our destination, Sammy Miller’s Motor-Cycle Museum. It took no imagination to realise this was the annual Harley Day. Sammy and assistant Vicky were there to greet and guide us into the parking area. Sun glasses were a necessity - so much shiny chrome. From 1922 models to custom V-Rods, they were all there. Seeing the bikes in the museum is a must for every motorcyclist, whatever they ride. It is literally quite awesome to see how machines have developed over the years and how riders endured to push them to their limits. Sammy Miller’s Harley Day has all the potential of being a phenomenal annual event. With the space and facilities, and the will of the surrounding Chapters, it couldn’t go wrong. And if it is only ever as good as it was this year, the ride there is more than worth it.